Boudoir Dolls; Bed Dolls or Sofa Dolls, Flapper Dolls, French Dolls as they are referred too, were used to decorate "beds & sofas", which is where they got their name. These dolls were not meant to be played with, but to be displayed or as decoration, which today we have replaced with a mountain of pillows. Made from about 1915 to the 1930s, boudoir dolls usually have cloth bodies with elongated legs, heads can be of various materials; all cloth, cloth with a mask face covering usually made of composition or all composition head, often with painted facial features, some have partial composition limbs some have celluloid arms, which may help with dating. 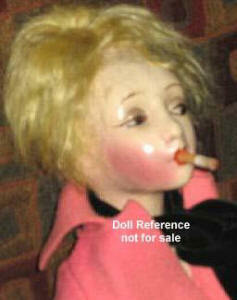 Boudoir doll heads were also sold separately to which a seamstress could add their own homemade cloth body. Clothing can be very elaborate, high quality material, (it's the clothing that matters the most on these dolls - if the clothing is missing they lose about half of their value) and many have high heel feet. There is of course, much variety among boudoir dolls, as they were produced in several countries over quite a number of years, notably; America, England, France, Germany and Italy. Boudoir dolls are usually unmarked - so finding its origins can be a "mission impossible" except by an expert, thus dolls are usually just identified by type as a Boudoir Doll. We particularly get a kick out of the politically incorrect (today) Cubeb cigarette, smoking dolls, as shown above right, made by the Mutual Novelty Corp. See below, for a list of the many doll makers of antique Boudoir dolls. T. A. F., Unique Novelty Doll Co, Nora Wellings, Ethel Westwood and others.